Not too long ago, petrol-powered 4WDs were the norm and diesels were far less common. There have since been vast improvements in diesel with turbocharging and, more recently, high-pressure common-rail injection. Ever-rising fuel prices have also contributed to the popularity of diesels and you can only speculate on what would be the relative sales of petrol and diesel 4WDs if fuel costs were somewhere around $2 per litre. In the Middle East and North America, where fuel is still relatively cheap, the popularity of petrol-powered 4WDs is as strong as ever. 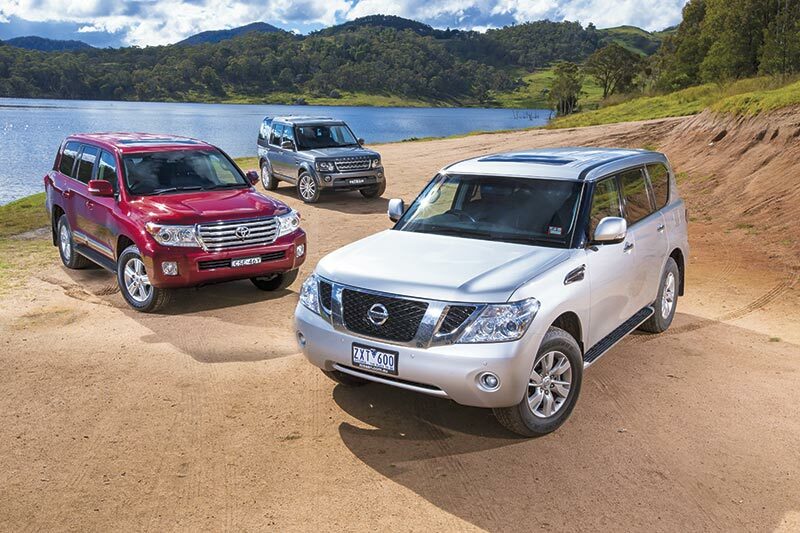 We lined up three petrol-powered heavyweights, all of which are relatively new. 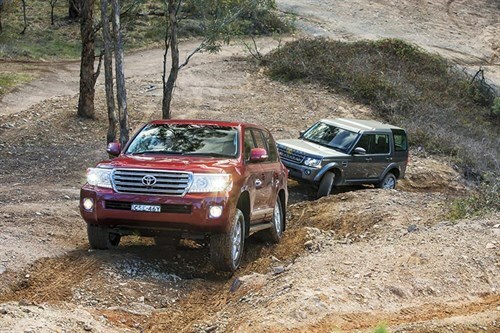 The Toyota LandCruiser 200 Series arrived in early 2012 with a new 4.6L V8 and six-speed auto, replacing its original 4.7L V8 and five-speed auto that was carried over from the 100 Series. 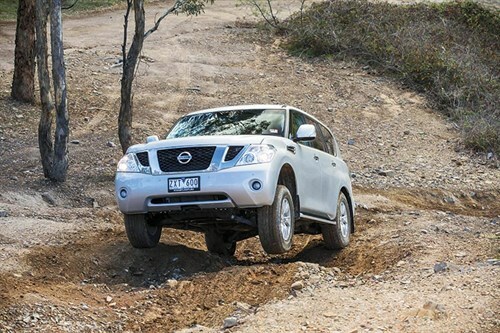 The 5.6L Y62 Nissan Patrol is newer again, only going on sale in Australia early in 2013, while the 3.0L supercharged V6 in the Discovery SCV6 is brand new, having just replaced the naturally-aspirated 5.0L V8. 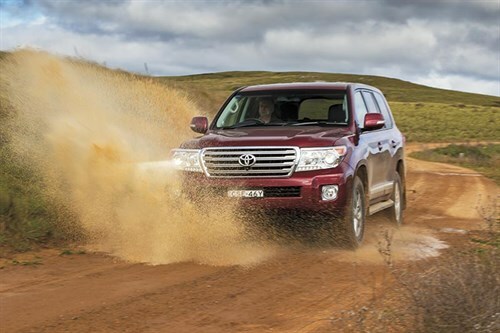 The LandCruiser’s 228kW/439Nm 4.6L V8 is a newer design than the 4.7 it replaced 12 years ago, and first appeared in various Lexus models overseas before making its way into the 200 Series. In terms of technology, the potent 298kW/560Nm 5.6L V8 in the Patrol ups the ante with both variable valve timing and variable valve lift on the inlet side, and direct fuel injection. The variable valve lift is used to “throttle” the engine in place of a conventional throttle valve, while the direct injection introduces the fuel directly into the combustion chamber rather than via the inlet ports or inlet manifold. The Patrol’s V8 is mated to a seven-speed automatic. The Roots twin-vortex supercharger is also more sophisticated than most as its boost pressure is controlled electronically so as to maximise its efficiency. It does this via a bypass valve that regulates the flow of air into the supercharger and therefore the amount of pressurised air leaving the supercharger. 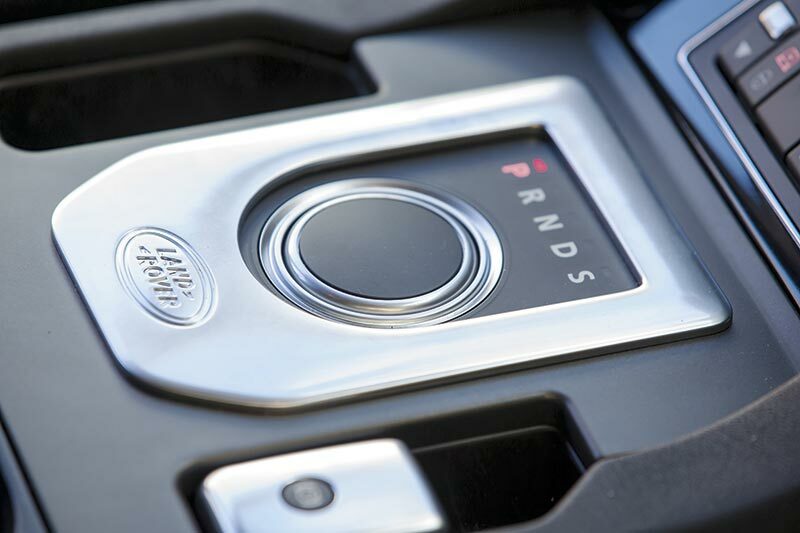 The Discovery also features the most sophisticated gearbox within the group, ZF’s excellent eight-speed automatic. These three powertrains deliver very distinct driving experiences, even more so than their on-paper differences suggest. The Toyota’s engine is smooth, quiet, highly refined and very unobtrusive. It’s also relaxed and effortless, but in this company it offered the least performance by a notable margin. For its part, the Toyota’s gearbox is slick, smooth and works nicely with the engine. 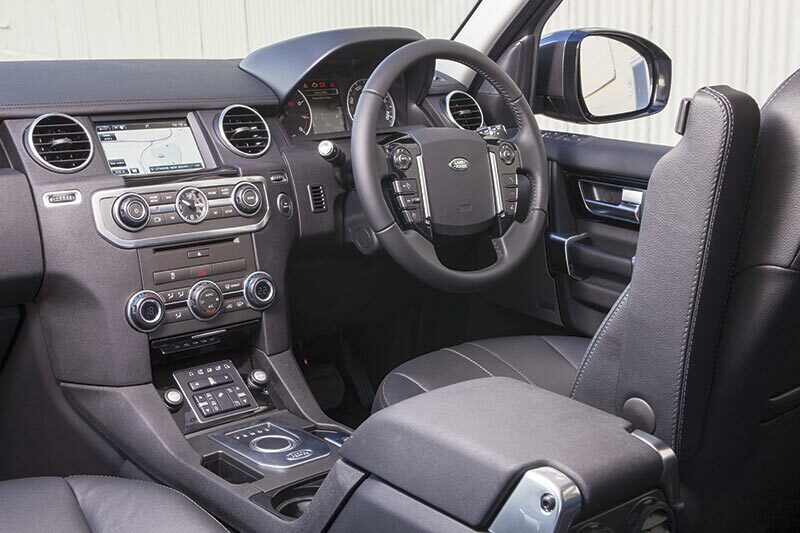 If it wasn’t for the extremely high standard set by the Discovery’s eight-speeder, you would think that it has the last word in refinement. The Patrol’s engine is a very different beast to that of the Toyota. While it’s smooth and refined, it’s also very vocal and makes its presence felt. Despite being nearly a litre bigger than the 200, it likes to rev hard and almost feels “cammy” by comparison. If the 200’s V8 feels like it should be in a luxury limousine, then the Patrol’s V8 should be in a race car. The Discovery’s supercharged 3.0L V6 feels completely different again to the two atmo V8s, although the counter-rotating balance shafts do a good job of delivering the sort of creamy smoothness generally associated with a V8 and far removed from most V6s. In some ways this V6 feels smoother than either V8 here, something that is possible as even crossplane 90-degree V8s (like the two here) don’t have perfect dynamic balance. (KDSS), a relatively simple but effective hydro-mechanical (no electronics) means of varying the tension on the front and rear sway bars to maximise the wheel travel offroad, but also minimise onroad body roll. The Patrol has fully independent suspension and, thanks to its active dampers, doesn’t require sway bars to limit body roll when cornering. The benefit offroad is that the wheel travel isn’t restricted, as is normally the case with sway bars. 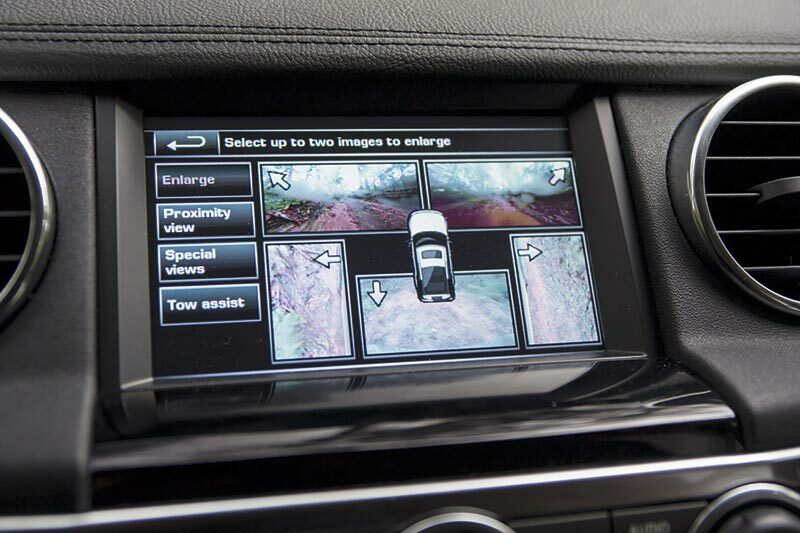 The Patrol also has driver-selectable “programs” for different driving environments and a driver-activated rear locking diff. Like the Patrol, the Discovery has fully independent suspension, but it uses height-adjustable air springs. The air springs are cross-linked so that if one wheel is forced up the opposite wheel is forced down, which in part replicates the action of a live axle. 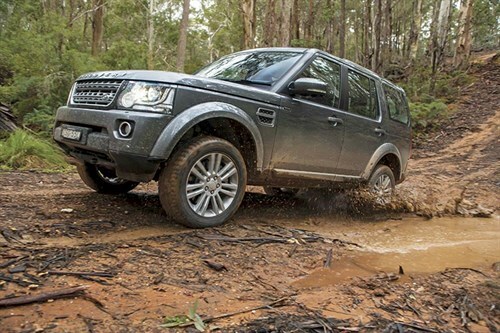 The Discovery’s key offroad attributes include the height-adjustable suspension, the optional ($1060) auto-activating rear locker and the most useful of the driver-selectable programs for different driving environments. 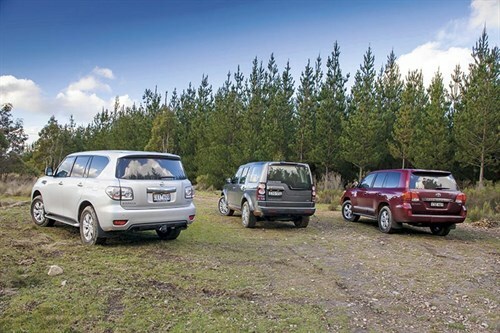 In part, the offroad contest comes down to the Toyota’s rear live axle plus traction control facing off against the independent rear ends and lockers of the other two. There’s little in it, but the lockers do make the difference. Other things come into it, of course, and the Discovery’s extra clearance afforded by the height-adjustable suspension is a significant advantage, even if the ride is harsh when the suspension is raised. 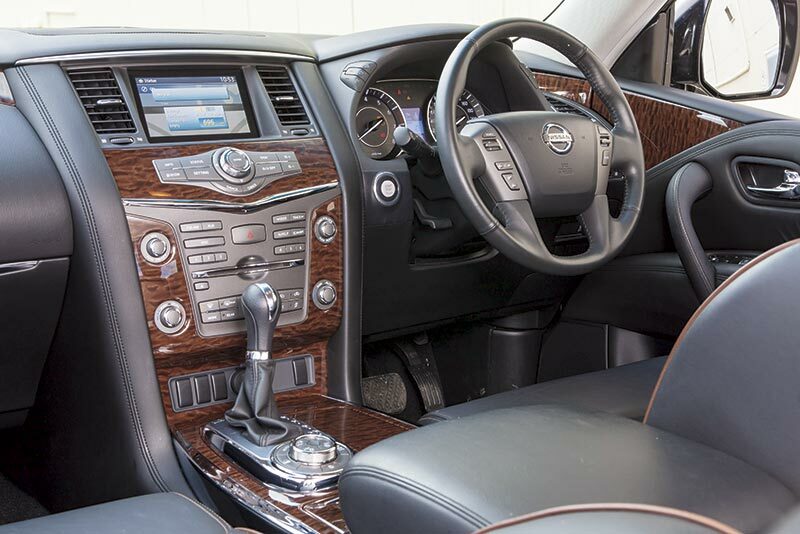 Vision from the driver’s seat, comfortably the best of the three, is also a Discovery strong point. In contrast, the Patrol’s clearance could be better, as could the driver’s vision. 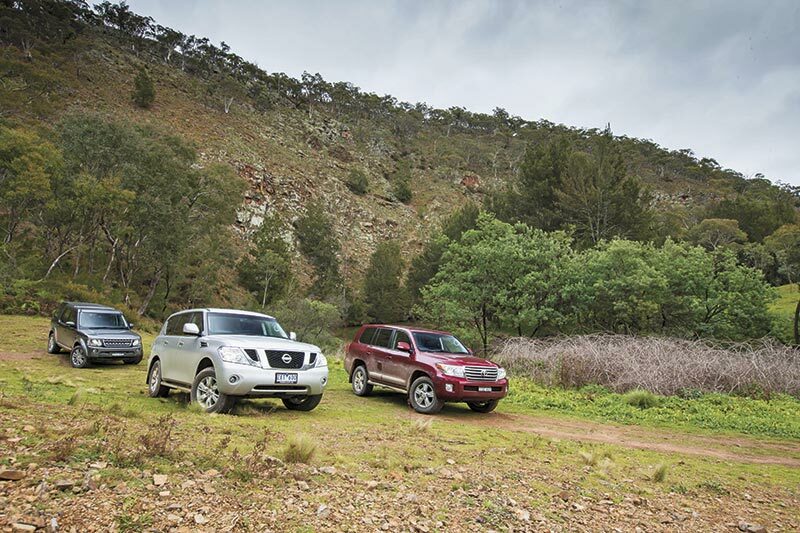 There’s no two ways about it; the Patrol is a big vehicle and it feels large and less manoeuvrable, especially in comparison to the Discovery. 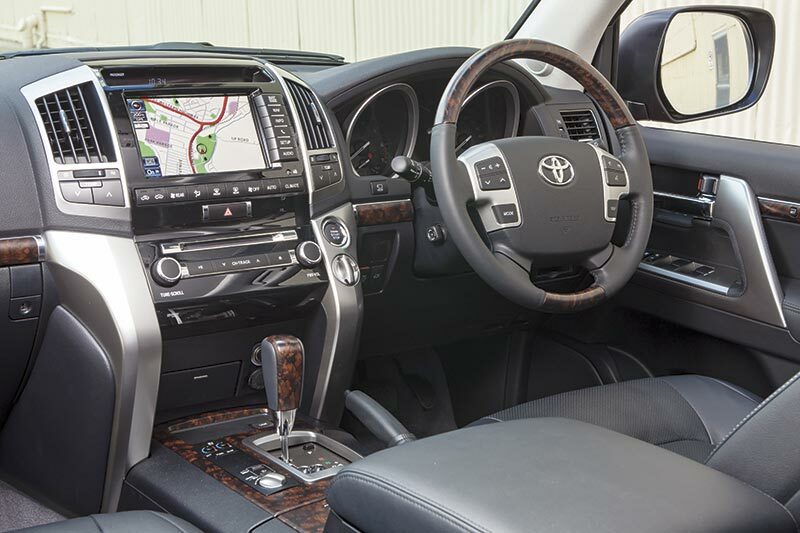 In terms of size, ground clearance and driving position, the Toyota falls between the other two, but excels for its comfortable ride and the relaxed way it manages offroad. You also can’t fault the Toyota for offroad practicality. It’s the only one here that will take a second battery in the engine bay with little trouble — the others are as good as impossible — and it ticks all the boxes for wheel and tyre spec, recovery hooks, and the like. The Nissan has even more tyre on it than the Toyota (265/70R18s vs. 265/60R18s), while the Discovery is somewhat hamstrung by its flimsy road-oriented 255/55R19 tyre spec. The question that needs to be asked here is whether you’d buy any of these large petrol wagons instead of the corresponding large diesel wagon? In the case of the Patrol you don’t have a choice right now. There is a diesel coming but it will be a few years away yet. The Patrol excels for power, performance and interior space. It also drives well both onroad and offroad. But it’s also the thirstiest and demands premium fuel. The Toyota’s strength lies in its practical virtues. It’s not the fastest or the best handling vehicle here, but it probably makes more sense than either of the other two as a buying proposition for a wide variety of reasons. 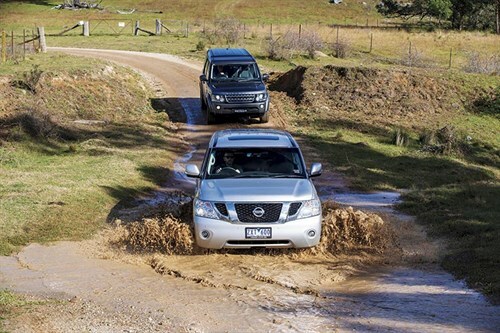 Like all Discoverys, the SCV6 is a delight to drive onroad and is still mighty capable offroad. The new supercharged V6 and accompanying eight-speed auto is a pearl of a powertrain and the best here. Fuel capacity and tyre spec remain as Discovery weak points, even if both can be addressed with varying degrees of success by the aftermarket suppliers. Would you buy a SCV6 Discovery before a SDV6 (diesel) Discovery? Absolutely, provided you are happy to pay the price in fuel. In return, you get a flexible, highly-refined and smooth engine that ultimately offers more performance than its diesel counterpart. Read more CTA handly helpful camping tips. If you don't want to miss out on all the latest news and reviews, why not subscribe to the monthly CTA magazine.